The regiment was raised by William Hodson, one of the most famous personalities of British India. He was the son of a vicar, an old boy of Rugby School and a graduate of Cambridge University. Hodson's Horse was born in the Punjab during the Great Mutiny of 1857. It was formed from risalahs raised and brought in to Delhi by prominent Sirdars. Hodson was at that time, on staff duty with the Delhi Field Force. By the time Delhi had fallen the regiment was large enough to be split into three separate regiments. Unfortunately Hodson did not live long enough to see this happen as he died in battle in March 1858. The three regiments of Hodson's Horse became two in 1860 when the third regiment was disbanded. The 1st and 2nd Regiments soon became the 9th and 10th Bengal Cavalry. The first overseas posting for the 9th was Malta, in 1878, and then the Sudan in 1885 in which year they became Lancers. The regiment then served in Chitral in 1895-7. In 1914 the 9th were stationed at Ambala so were sent to France with the Ambala Cavalry Brigade. They stayed in Europe until February 1918 when they were posted to Palestine. They finally returned to Ambala on 1st January 1921 creating a record for length of time spent overseas, more than 6 years. The division of Hodson's Horse into three regiments was formally approved in a General Order by the Commander-in-Chief on 26th August 1858, Allahabad. The 3 regiments were designated a corps whose commander was Major Henry Daly. Each regiment was to have 6 Troops. It was also decided that those sirdars who had brought in a Rissalah (a group of cavalrymen from their community) to Hodson's Horse and been granted the rank of risaldar, should retain the title even though that meant that the regiment was oversubscribed with men of that rank. The first commanding officer of the 1st Regiment of Hodson's Horse was Capt Walter Grant but their first action was led by their 2nd in command, Lieut Charles Palliser who later became the first CO of the 2nd regiment. The column, led by Brigadier-General Horsford confronted a group of 4,000 rebels who called themselves the Nasirabad brigade. They were formed up at Daudpur with six guns but decided to withdraw and were chased by the cavalry. The enemy lost many men but few casualties were sustained by the British. There was another action at Dohlpur on 27th Oct when the regiment was with Hope Grant's column and attacked a defended position by a river. The enemy ran off and hid in ravines and jungle. It turned into a search and kill operation in which Lt Palliser was shot and nearly killed but for the help of a Pathan sowar who was with him. The sowar sprang from his horse and slashed at the enemy sepoy with his sword. On the same day Jamadar Man Singh was also wounded. The two regiments, again under the command of Hope Grant engaged and routed a large force led by the Rajah of Gonda. They captured 4 of their guns and caused many enemy casualties. They occupied Gonda and soon the whole of Oudh was cleared of rebel forces. The last battle of 1858 was at Basantpur where Risaldar Ghulam Muhammad Khan was killed and four others wounded. In 1859 there was a skirmish near Kamdakot on 4th January, followed by a three month period of inactivity. A force led by Brigadier Horsford was in the region of Tulsipur when intelligence reports indicted that the enemy were established near the Jarwa Pass on the border of Nepal. A detachment that included 30 men of the 1st Regiment was sent forward but were heavily outnumbered so the remainder of Hodson's Horse under Major Daly hurried to their aid. They arrived just in time and drove the enemy through the pass. One man was killed and 9 wounded. Daly was mentioned in despatches and Dafadar Changan Singh was awarded the Order of Merit, 1st Class. The last battle of the Indian Mutiny fought by the 1st Regiment involved a detachment of 50 men under the command of Lieutenant S G Warde. The enemy had raided the village of Lalpur but Warde's men forced them out of the village, and the surrounding area, with only one sowar wounded. Since the regiment had been raised during this emergency and remained on active service throughout there had been little time for establishing themselves in quarters. But they settled at Faizabad on 4th January 1860 where they remained for two years. They occupied themselves with training and standardising their equipment. During this period , on 31st may 1861, they were re-titled the 9th Bengal Cavalry. Their strength was 13 native officers and 480 other ranks, organised into 6 Troops (3 squadrons). On 8th April 1862 the 9th Bengal Cavalry were ordered to Bhutan and the 3 squadrons sent to different places. One squadron with the HQ went to Jalpaigori, the 2nd to Barhampur, and the 3rd to Raniganj. The unfortunate squadron at Barhampur suffered an outbreak of sickness which resulted in several deaths. In April 1863 they were ordered to Benares where, on the 14th April, the Commanding Officer, Major John Caulfield died, aged 43. He had been CO of the regiment since 8th Sept 1859. In the middle of these troubles an order was issued that the regiment must be composed of one squadron of Sikhs, one squadron of Punjabi Muhammadans, one Troop of Pathans and border tribesmen, and one Troop of Dogras. How this order was carried out while the regiment was split up is hard to imagine. Since the days of the Mutiny there had been a very high proportion of Sikhs in Hodson's Horse. The regiment moved on to Cawnpore on 29th April 1863, then Peshawar in January 1864 where they stayed until November 1866. Their next post was more permanent, at Mian Mir, for 4 years. During that period, in 1868, they were part of a punitive expedition to the Black mountains in Hazara, but they saw no action. They spent another 4 years at Deoli, with a detachment at Jhansi, then moved to Meerut on 8th March 1878. Shortly after settling in at Meerut, the 9th were ordered to prepare for foreign service. No indication was given as to their destination but there was speculation that it had something to do with the conflict between Russia and Turkey. They travelled to Bombay by train in April 1878. They were brought up to strength with a squadron from the 10th Bengal Cavalry, making them around 550 men. At Bombay they embarked for Aden where they were ordered to Suez and then to Malta. They disembarked at Malta on 6th June and pitched camp at San Antonio. The 9th/10th were brigaded with the 1st Bombay Cavalry. The force that gathered in Malta included 2 batteries of artillery, 4 companies of Indian Sappers and Miners, the 2nd Gurkhas, five Indian Infantry regiments and two Indian cavalry regiments, all under the command of Lieutenant-General Sir Garnet Wolseley. Their eventual destination was Cyprus which had been ceded to Britain by Turkey in exchange for their support against Russia. Whilst in Malta the force was inspected by the Duke of Cambridge who bestowed his title on the 10th Bengal Cavalry which was represented by one squadron. But a day or so before departure for Cyprus the regiment was prevented from embarking with the rest of the army because 48 men were poisoned. Their regular dose of lime juice had been replaced by disinfectant fluid, whether by accident or design was not known as the person to blame was never discovered. Three men died in agony and the rest were permanently disabled. As a result, the regiment stayed in Malta until October when they sailed back to Bombay. Some startling news reached the regiment in February 1885 while they were in Wazirabad. There had been disappointment throughout the regiment after their first foreign posting had turned into such a disaster. The Malta journey had been part of a historic and unprecedented expedition to Europe and they had been forced to turn back. But now the regiment was ordered to convert to lancers and move off to join the British Army in Sudan. They travelled to Cawnpore where they received lances and Mackenzie equipment as well as any other items needed for field service. The regiment was commanded by Lieut-Col A P Palmer. The arrival of Indian troops at Suakin in March was in response to unrest stirred up in the Sudan by the Mahdi and an Arab sheikh and slave-dealer called Osman Digna whose armies had been defeated at El Teb and Tamai. General Gordon had been killed at Khartoum on 26th January. Osman Digma's Arab army (Hadendowa) had to be dealt with before confronting the Mahdi. 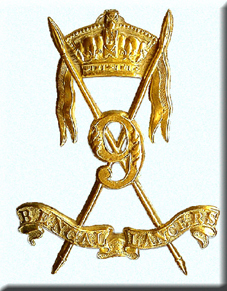 The strength of the 9th Bengal Lancers was 10 British officers, 13 Indian officers and 475 other ranks. The other cavalry units were 2 squadrons each of the 5th Lancers and 20th Hussars. There was Indian and British Infantry as well as Marines, RA and RE. The force numbered 18,400, all commanded by Lieut-General Sir Gerald Graham VC. To the west of Suakin, a coastal town on the Red Sea, are rocky hills and flat land covered with scrub and thorn bushes. It was difficult country for cavalry. The army had camped near Suakin and were struggling to cope with the heat and lack of water. Also the Arabs came down from the hills at night to snipe at the men in camp. The first action that the 9th saw was when the cavalry were ordered to attack Hashin. As they approached, the enemy ran off leaving the village empty, so the cavalry returned to camp. The following day saw an infantry battle at Dihilbat Hill and Beehive Hill near Hashin. When Brigadier-General Ewart, commanding the cavalry saw enemy heading off southwards he ordered the 9th to cut them off. But they were threatened by enemy on Dihilbat Hill so one squadron, under Major Robertson dismounted to fire back at them. Some spearmen suddenly came at them through the scrub and there was frantic hand-to-hand fighting. Twelve men of the regiment were killed, including Ressaidar Shibdeo Singh. Major Robertson was badly wounded in the leg while saving a sowar, and Capt Garstin, who was to become their CO in 1894, was hit by spears twice but escaped serious injury. The Order of Merit was awarded to Risaldar Hukm Singh and 9 others for gallantry. At the same time, more of the enemy tried to cut off Lieut-Gen Graham and those who were working on redoubts on Zeriba Hill, northeast of Hashin. They were charged by two squadrons of the 5th Lancers and two squadrons of the 9th BL with complete success. A detachment led by Major-General Sir John McNeill VC was ordered to set up an intermediate post between Suakin and Tamai, their next objective. This was an infantry operation but was accompanied by the 5th Lancers. While they were constructing a triple zeriba (fortified enclosures made of thorn bushes) they were surprised by a massive attack from 5,000 Arabs which nearly overwhelmed them. Brave efforts were made by men of the Berkshire Regiment and the 15th Sikhs which prevented the destruction of the force. But the camel drivers and followers streamed back to Suakin with their animals and were pursued by the Hadendowa Arabs. While this was happening, a squadron of the 9th BL, under Lieut Peyton, and a squadron of 20th Hussars were on the road from Suakin and hearing gunfire, headed towards the sound of battle. They saw the fleeing men and animals coming towards them and formed an extended line enabling them to run through. The pursuing Arabs were attacked and driven off. They joined up with t[9th athe 5th Lancers and helped McNeill's men disperse the enemy and round up the animals. The advance on Tamai continued on 1st April, with the 9th providing daily scouting parties. When they reached Tamai, it was deserted so they were ordered to burn the place down to prevent Osman Digna using it as a base. The next objective was the building of the Suakin-Berber railway. The cavalry were employed on protection duty, they were also required to return to Hashin to bury the dead from the battle of the 20th March. Another sheikh, Muhammad Adam Sardun, in league with Osman Digna assembled a large group at T'Hakul, 10 miles west of Hashin. Graham planned a two pronged attack using infantry from one direction and cavalry and mounted infantry from the other. On being confronted by the infantry the enemy withdrew to their camp but met the 9th BL while 2 companies of mounted infantry fired at them from surrounding hills. The Arabs didn't know which way to turn and were thrown into confusion. In their panic they abandoned all their sheep, goats, donkeys and camels as well as grain supplies etc. which were of great use to the British and Indians. The expedition had achieved it's objectives. Osman Digna was a fugitive and his followers dispersed. The 9th had proved themselves to be a very effective cavalry regiment and were now proficient in the use of the lance. Their total casualties were 2 Indian officers dead (one of disease), 12 men dead, 2 British officers and 22 other ranks invalided. They returned with 52 fewer horses, although whilst there they had received some fresh Egyptian mounts. But rather than being pleased with themselves, the men of the 9th left Saukin feeling that their achievements were for nothing, because the British government announced that the Mahdi was to be left unopposed and British forces withdrawn from Sudan. Regimental HQ and two squadrons of the 9th embarked on two ships on the 9th and 10th June 1885, reaching Bombay on the 19th and 21st. They travelled by rail to Ambala, arriving on the 26th and 28th June. The 3rd squadron was required to stay in Suakin until 20th November. There were 150 men in the squadron led by Capt Mackenzie and Capt Dawson. They must have been dismayed to receive the order to stay on. It was a very uncomfortable posting and the temperature rose to 120 degrees in the shade. They had little to do and probably felt that their presence was unnecessary. The Viceroy, Lord Elgin held a durbar and review at Lahore in November 1894. The regiment attended this and then marched to a camp at Muridki. While there, on the night of 20th December, a daffadar named Kartar Singh, bearing a grudge through loss of promotion, shot two officers, Risaldar Kesar Singh and the Commanding Officer, Colonel Ernle Money. He would have killed more if he had not been overpowered by Jemadar Ajub Khan. He was tried at Rawalpindi by a court martial made up of Indian officers, and publicly hanged on 31st January 1895. It transpired that two Sikh officers had encouraged the daffadar and they were tried in a civil court and sentenced to transportation for life. Although the regiment has the battle honour 'Chitral' their involvement was not very active. The field force, led by Major-General Sir Robert Low, assembled at Hoti Mardan in April 1895. The 9th were to assume garrison duties at Mardan, sending one squadron on to Dargai to protect the lines of communication. Two squadrons then went forward to join the Chitral Relief Force but went no further than the Swat Valley. The relief occurred on 20th April and the regiment returned to Rawalpindi in May. In 1895 the organisation of the army in India was changed so that there was only one Commander-in-Chief overall instead of three Presidencies. The Bengal regiments were re-organised to come under the Bengal or Punjab command, and the 9th Bengal Lancers, although they retained their name, came under Punjab. The tribal attacks started in June 1897 in the Tochi Valley but after an attack on Shabkadar Fort, on 10th August, the regiment was ordered to proceed by train from Rawalpindi to Peshawar. At the same time a Troop went to Shabkadar, escorting guns. Then came the attacks on the Khyber Forts which involved the regiment in further movements but the mobilisation of the Tirah Expeditionary Force did not start until early October. The Force was split into three columns. General Sir William Lockhart led two divisions as the main column, into Tirah while the other two, the Peshawar and Kurram columns advanced on the flanks. The 9th, commanded by Major Dawson, were part of the Peshawar column which saw less action than the other two. However, one wing of the regiment was forced to fight it's way out of a dangerous situation on the Bara River. Capt. Brasier-Creagh was leading B and D squadrons with Lieuts. Smith and Maxwell, having been ordered to reconnoitre the road to Mamanai through the Gandao Pass. Whilst coming back along the Bara River, the Captain and D squadron were fired on from the front. Their escape route to the rear was also blocked by snipers. At first they dismounted and returned fire but it soon became clear that the only answer was to mount up and ride right through the enemy. They sustained heavy casualties, a jemadar and 5 men were killed and 4 wounded. The horses also suffered, with 18 killed and 9 wounded. Sixteen NCOs were recommended for gallantry awards and Kot Dafadar Mir Jafar Khan was given the Order of Merit.